Screen-printing workshop organized by Womxn is Work in Liverpool, UK, 2018. Credit: Jazamin Sinclair/FACT/ Liv Winter/Grrl Power. All rights reserved. From a statement produced by the Womxn is Work project in Liverpool, England, 2018. But in Liverpool and thousands of other communities this is being challenged by grassroots groups who are determined to publicise the injustice of unrecognized labour and support women to deal with its implications in concrete terms. For the past ten months we’ve been working with a number of these groups to document their stories as part of a collaboration with the Foundation for Art and Creative Technology (FACT), a media arts centre based in the city, and Voluntary Sector North West, a charity that aims to shape policy to support social justice. One of these groups is Womxn is Work, an art-led campaign built around a critique of gender based marginalisation that was developed under FACT’s Future World of Work programme. The group is made up of school students, mothers, carers, teachers and retired women who are united in the fight against unrecognised labour, and who have made a special effort to include minorities that are often ignored in mainstream feminism - hence the inclusion of ‘x’ in ‘womxn.’ Artist-activist Liv Wynter and a local research collective called “Grrrl Power” developed the approach for the campaign by drawing on radical organising, social critique and art. Screen-printing workshop organized by Womxn is Work in Liverpool, UK, 2018. Credit: Jazamin Sinclair/FACT/Liv Winter/Grrl Power. All rights reserved. 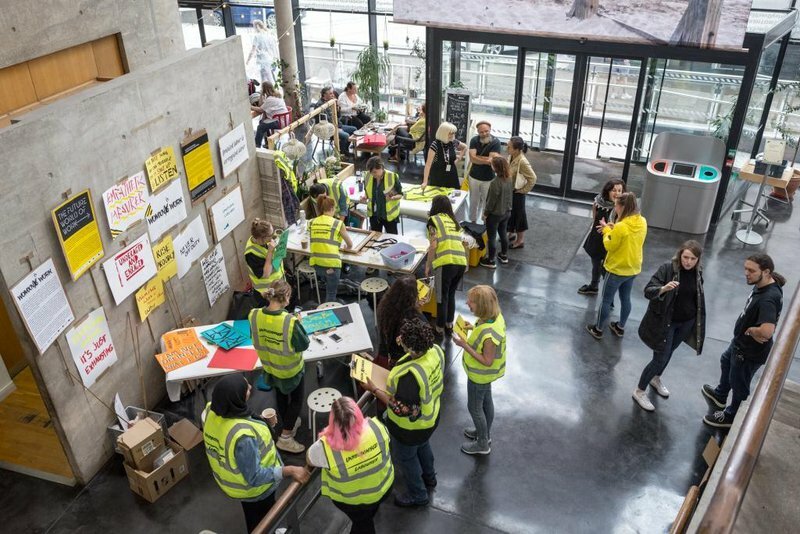 At FACT’s mixed use cultural venue in Liverpool city centre, for example, Womxn is Work created a safe space for women and non-binary people to work together, culminating in a screen printing workshop where personal experiences were converted into powerful visual provocations exploring the future world of work. But how do these provocations show up in real life? How does recognising the importance of emotional labour create the foundations for women to gain power, knowledge and equality? In an area that has experienced historic industrial decline, everyday life for many women living in north Liverpool can be a struggle, juggling numerous roles that include paid employment, looking after children, caring for relatives and minding their grandchildren because childcare is too expensive, so unrecognized labour is a fact of life. As a grassroots charity the Swan Women’s Centre can’t address entrenched poverty, but it does provide a break for women from the everyday experience of struggle, described by one volunteer as the “stuff out there and the things in our heads which we can’t escape from.” In so doing the Centre creates opportunities for women to take care of themselves, ultimately sustaining the textured and informal networks of care that communities are built on. Workers and volunteers at the Swan Centre in Liverpool, England. Credit: Joe Entwistle. All rights reserved. Sue (not her real name) is a good example of this approach, someone who was too anxious to even open her letters when she first met Rita; as a result, she “would get in all kinds of trouble, and get into terrible debt.” Sue now opens her post, and doesn’t have “piles of letters” in her house anymore. Her experience of mainstream social services often felt like a “punishment,” where she was just treated as a number. In contrast, the Centre staff support her as a person, and help with changes at a pace that she’s comfortable with, so she can now do things that other people would consider everyday activities - like going to the shops or putting the washing on the line outside. Sue feels that at least she “has some form of normality now,” and no longer “beats herself up” about things she can’t manage at the moment. Such changes are incremental, but they can add up to be transformative by helping women to reclaim control over their lives. Central to this process is the fact that staff and volunteers listen to women on their own terms. There is professional counselling available, but more informally there’s always someone available to have a chat over a cup of tea. 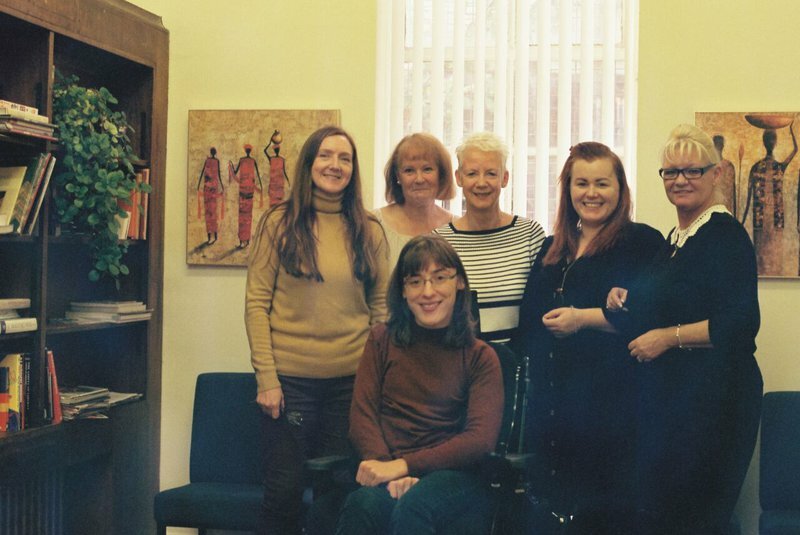 And if women don’t want to share their experiences they don’t have to; they can join one of the Centre’s social groups instead such as a coffee afternoon, gardening, or mosaics and creative writing classes. By creating spaces that represent a rupture with the struggles of everyday life and which feature relationships rooted in listening, mutual respect, and participation, both the Swan Centre and Womxn is Work demonstrate the potential of everyday radicalism to expand our democratic imaginations. The Womxn is Work campaign raises vital questions about society’s relationship to unrecognised labour, but it also shows that there is still much work to be done. Relating the feminist ethics of care embodied by the Swan Centre to these questions can help us to re-imagine how everyday politics is carried out in ways that value caring, listening and cooperation. Taken together, these groups highlight the foundations of care that underpin healthy communities and economies, inviting us to consider how to recognise and support the crucial role of emotional labour in society in more egalitarian ways.